the birthdays and parties with your homemade cake. Place a thick bottomed pan on very low flame and melt butter in it. Remove from the flame and let the butter cool. Add condensed milk and mix well. Whip the cream till light and fluffy. Take a pan with little butter and put the maida mixture with the condensed milk-butter mixture. Sift maida, cocoa powder, baking powder, cooking soda and salt together. Make sure there are no lumps in the mixture. Grease a baking tray with little butter. Dust it with maida and keep it aside. Now add aerated cola and mix it well. When it is done, let it cool and then slit it horizontally into two. Sandwich the two layers of cake with whipped cream and cherries. 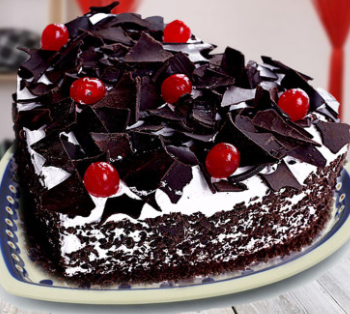 Top with whipped cream and cherries. Grate dairy milk chocolate bar and sprinkle over the cake.